Brady's newest label printers both offer excellent options for fast, quality label making. But while the BMP51 and BMP53 share many of the same specifications, how do they differ? 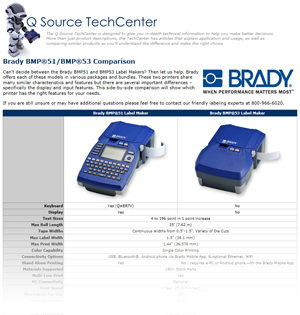 Our latest TechCenter article, "Brady BMP®51/BMP®53 Comparison," was created to help give you a side-by-side look at everything you need to know to choose the best printer for your labeling needs. If you still have questions after viewing the comparison please feel free to contact our Brady printing experts at 800-966-6020 or send us an email. And remember, Q Source is your Brady Printing & Labeling resource offering an extensive selection of Brady printers, labels, accessories and more.